It is that time of year again when students panic about the upcoming exams and us teachers worry about how to use the last vital few lessons as the countdown gains momentum. In my time in the profession I have tried all sorts of ways to use the lesson time from quizzes, silent prep, Q&A, group work and a whole host of other creative (and less creative) techniques with mixed results, it is difficult to say exactly what works best for Sociology revision but there does seem to be a con-sensus amongst many experienced teachers that the onus should be on the student. With this in mind, you as the teacher should not be doing all the work, this is revision time after all and not teaching time, of course students will fire questions at you but this is a time of year when the students need to be the ones feeling the stress, doing the work and remembering the details. It is a cliche to say of course but they are the ones taking the exam and not you! For this reason I think the most successful revision lessons are delivered without any books, revision packs, notes or resources of any kind out on the table. In my experience many students feel they are revising when they have all their materials in front of them but come exam time those items will not be there, students have to remember the facts and details without the security blankets in their hands. Of course it depends on the learner but simply reading notes and a text-book is not always an effective technique for many students. When I was an A-level student I remember my friends arguing that I never revised because I was not one for sitting in my room with my books, I was often out going for a run or on a bike ride but what I used to do was think through how I would answer a particular question if it came up. I said the introduction and explanations in my head and imagined the conclusion I was going to write. Many would say this is an odd way to revise but I was revising with exactly the same materials I would have in the real exam i.e. nothing but what was in my head. So, what can you do in the classroom without the resources? To learn the sociologists or key con-cepts then one idea is to play ‘Last one standing’. You ask all the students to stand up, randomly throw a soft-toy or a teddy to a student, say a term to them and they have 3 seconds to reply the relevant sociologist associated with the term. If they say the wrong Sociologist or they cannot an-swer then they have to sit down, you keep going until you have the last one standing. I often do this as a warm up as it gets the students thinking quickly and once they have done the task a few times they get very good at it, you can then reduce the time to 1 second. A similar task to this is getting the students to consider how to counter argue and critically analyse. Write a question up on the whiteboard. You then throw the soft-toy to a student to explain a point on one side of the debate, this is thrown back to you, you then throw it to another student who must counter argue the point previously made, the debate then goes back and forth using all the students in the class. The reason I like this activity is that because the soft-toy comes back to you after each point you can target particular students – maybe the ones that always try to get away with saying nothing or the one trying to look at their phone under the desk! Depending on the size of your class then mind maps on the teacher whiteboard can also be really useful, the students seem to like the power of using the teachers pens and whiteboard to write all over! This is useful for learning a perspective or theory. For example if you were getting the stu-dents to consider ‘Feminism’ then they can branch off into different strains of Feminism using a range of colours. At the end the students can take a picture of their artwork on their phones or save it if you use an interactive board. I think what students like about this task is that it is personal ownership, they created it, they put it together and they often realise they have a lot more knowledge in their heads than they thought they did. One final task I tend to do on the final lesson before the exam is ‘Speed-writing’. Each student is given an A3 piece of paper with an essay title at the top, the page is then divided into ‘arguments for’ and ‘arguments against’ in the form of an essay plan. Each student has 4 minutes to complete as many ideas, sociologists, key terms etc as they can, use an online countdown clock so that at the end of the 4 minutes there is a nice loud buzz! Each student then passes their paper clockwise to the next student. They then have to read through what has already been written and keep adding to it. You continue this process until each student has seen all the questions but of course it gets increasingly more difficult to think of ideas as you get towards the end. I always then photocopy all the completed questions down on to A4 so that each student ends up with a plan for all of the es-say titles. Two small tips- get the students to write small so that they can all fit their responses on and make sure they use a black pen so it photocopies well. I am sure many of you have used some of these tips before but I also know it is a frequent concern of many Sociology teachers to be running out of ideas at this time of year. It is essential that we remind ourselves that revision lessons should be just that however, revising what they should al-ready know and just maybe the time their teacher threw a soft-toy at them 6 times in one lesson asking ‘Who talked about the 4 functions of the family’? will make it stick in their mind. Good luck one and all! Matthew has been teaching Sociology for 15 years and has taught in the UK, Kenya and Spain; he currently teaches at Bellerbys College in Brighton. Matthew runs the www.podology.org.uk website. 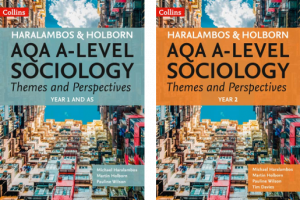 He is also a contributing author to the new AQA A-level Sociology Themes and Perspectives books.